Although I was not in Japan anymore, the cheapest flight to and from Sendai goes through Incheon Airport in Korea. On my way to Sendai, I had a three-hour layover and managed to explore the Airport, at least a small part of it. Incheon Airport is huge! It’s also the most amazing airport I’ve been to, with free resting areas with beds, free fast wifi, and even free shower. However, I noticed it’s quite expensive also, in both its souvenirs and food. On my way back, though, I was provided emergency funds to ensure I was well-fed and can safely reach home, so I had enough to try out one of the food places there. I opted to try one of the two Korean-specialty food places in its food court (at least the one closest to my gate), Sonsoo Bansang. To order, you have to actually go to a communal cashier that caters to half of the concessionaires of the food court. 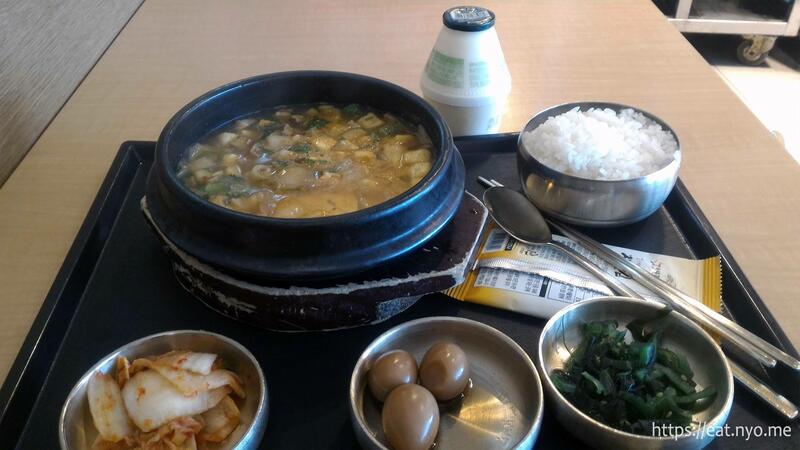 I got the Soybean Paste Stew with Beef Brisket (9000 Krw). 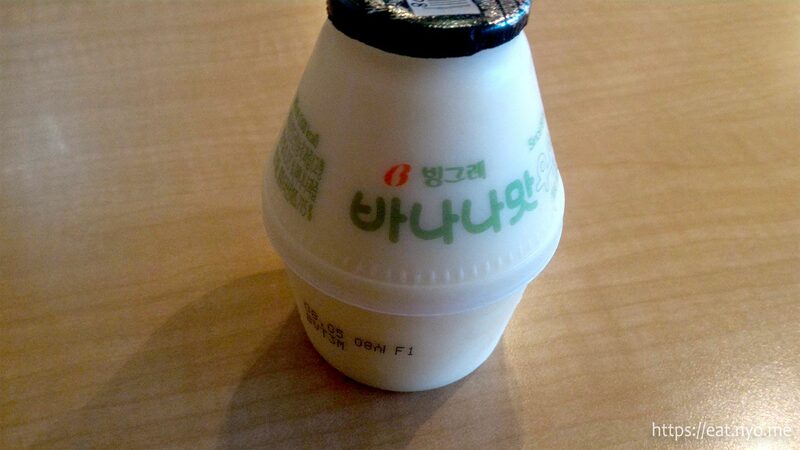 Although technically served by the airport food court and not Sonsoo Bansang, I also got a Banana Milk (1300 Krw). After this, I was given one of the food court paging system thingies that vibrate when your order is ready. I sat down near Sonsoo Bansang since I had some luggage with me. I got used to Japan’s promptness in their restaurants, which serves their food maximum five minutes from all the places I’ve tried there. I had to wait around fifteen minutes for my order. 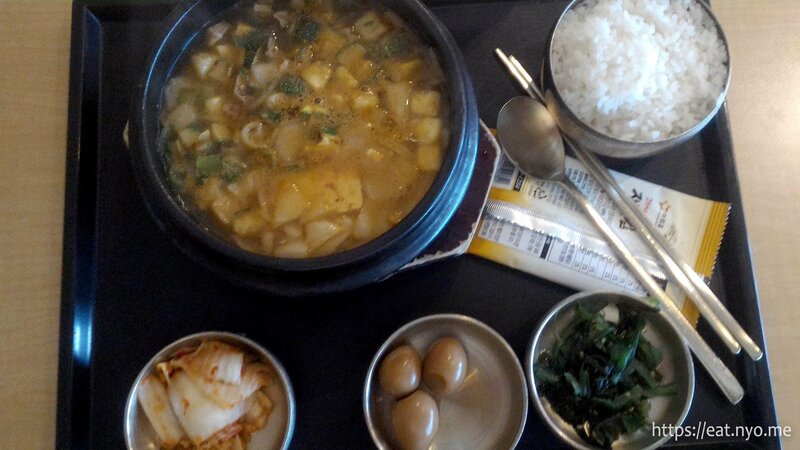 The Soybean Paste Stew with Beef Brisket was served boiling in an earthenware pot with three different banchans and a bowl of rice. The included banchans were some sort of seaweed, marinated quail eggs, and, of course, kimchi. Since the soup was still boiling, I sampled the banchan first. I enjoyed all of them, noting that the kimchi, despite being not as red as what I’m used to, was quite spicy and also had a noticeable acidic flavor as well, and yet still quite crunchy. As for the stew itself, there’s quite a lot of semi-hard veggies here. I cannot confidently say what these are, but based on research it’s aeohobak, a zucchini native to Korea. There’s also some soft tofu here and, of course, the beef. There’s not a lot of beef, but it they were quite soft and tender. The dominant taste was very spicy miso, even spicier than the kimchi. I wasn’t able to finish the soup, but I was able to finish most of the stuff in it. The sweet Banana Milk definitely help alleviate the spiciness, and without this, I might not have been able to finish the good stuff of the stew. My main complaint is that it’s quite small, and I could’ve finished it in one gulp had I not rationed it for my spicy main dish. Similar to Route Inn Hotel’s buffet, after you say your gochishosama, you must bus your trays and tableware to the alloted area. Overall, it was an okay meal. Despite having a lower tolerance to spicy food, I actually enjoyed the stew, especially the firm veggies that was plentiful in it. My main complaint was that there’s not much beef here, and I thought it could’ve used a couple more slices. Seeing that this is perhaps the most economical choice if you want Korean food in the particular food court I happened to be in Incheon airport, Sonsoo Bansang was worth the try. Recommended for: Spicy food lovers/toleraters. Not recommended for: Spicy/Korean food haters. Smart nomnomnom tip: Blow/airate the soup, it’s quite hot, both in temperature and flavor.